The stocks listed below are all trading within 10% of the 200-day moving average and have been leaders over the past year. Fundamentals are better than the majority of the peers in their industry groups and the technicals show potential opportunities. Many of the possible opportunities will struggle if the market takes a turn for the worse so please understand the “general market trend”. They are not recommened buys so please do you own due diligence! This screen is performed nightly looking for stocks that are trading higher within the set parameters. These include fundamentally sound stocks with increasing earnings, a gain during the day today and preferably a move on above average volume. 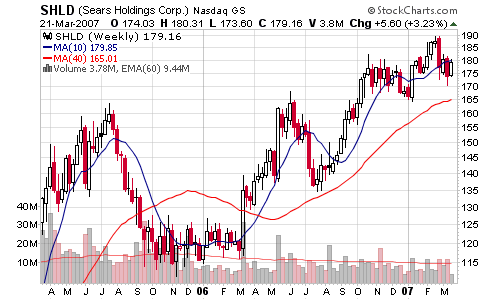 SHLD – 179.16, the stock is consolidating once again but my ideal entry would be closer to the 200-d m.a. near $165. Stock Predictions for 2007 – Oh NO! Ticker Sense, the blog run by Birinyi Associates, conducted a year end survey that looks towards the future. It’s titled the “Financial Blogger Outlook” and included 29 of the web’s most prominent financial bloggers (in their opinion of course). They asked a number of questions about the closing prices of the major indexes, the best and worst performing sectors, the top stock picks for 2007 and more. I was reluctant to participate because predictions don’t mean a damn thing in this business but I did it for fun. I was probably the last blogger to submit my survey and I belive that I actually missed the deadline because I was going to skip the “prediction business”. However, I’ll look back on what I wrote at this time next year and will assure you that my predictions won’t guide my trading one bit. So, what was my forecast? Why use the word forecast? Because this word is always associated with the weather and weathermen are typically wrong. Stocks predictors can be lumped into the same stereotype because they are usually wrong too. I predicted that the major indexes would be slightly lower at the end of 2007. I predicted that energy and financials would be the top performing sectors. I predicted that consumer related sectors would perform the worst. I predicted that growth stocks would outperform value stocks. I made several selections from the survey that matched one stock’s performance versus another stock’s performance. For example, APPL and MSFT were included in this section. You’ll have to wait until TickerSense publishes these results to see how I selected. Finally, they asked for five stocks that I felt would outperform their peers in 2007. Once again, I will stress that these stock predictions mean absolutely nothing to me and should mean nothing to you but I’ll tell you what I wrote. Since I was already compiling a similar watch list on the MSW Weekly Screens, I decided to go with a few young stocks that seem to be trending higher, near new highs with products or services in demand. A complete CANSLIM approach when you think about it! I have stopped trading for the year due to the holidays, visiting family in NY, family coming to NJ and the New Year bash at my house. Bash might not be the right term. Even though I have stopped trading, I have not stopped my research so I can step right into the game come January. I am searching for stocks that are trending higher, have increasing earnings and are fairly young to the stock market (IPO’s within the past several years). Here are the five stocks that I am watching for early 2007 and the exact stocks I selected to outperform in 2007 on the survey. Don’t listen to me, listen to the stocks and act accordingly because predictions are typically wrong! 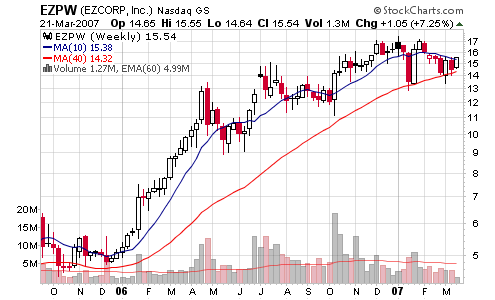 ICON – 19.82, the ideal entry for this stock is near $17.50 or the 200-day moving average. Volume has been increasing as the stock has been trending higher over the past 18 months. 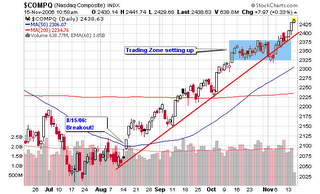 I do expect a consolidation period before the next advance but that is just my opinion. Let the charts tell you what is happening. NMX – 129.01, a young sister stock of CME, ISE, ICE and BOT. Based on the success of the others, I have no reason to expect any less out of this recent IPO. The stock is currently ticking higher over the past couple of weeks but there is still a lack of technical data to get a true picture. 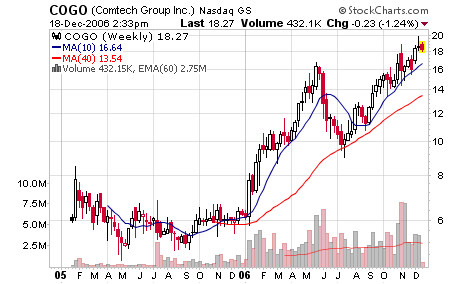 A stock I will definitely be watching in 2007 based on my success in ISE and ICE. COGO – 18.50, Comtech is trending higher but is now extended from the 200-d m.a. with a reversal to end the week. Volume has been increasing while the stock reached and floats near new high territory. The ideal entry area is along the 200-d m.a. with shorter term entry points near the 50-d m.a. 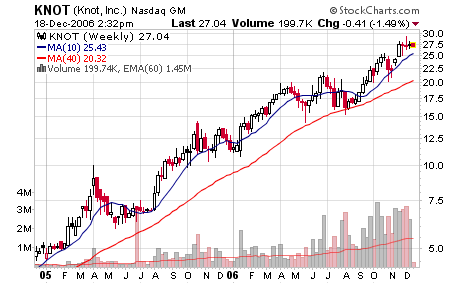 KNOT – 27.45, the stock has made multiple daily and weekly screens (MSW Index) over the past year but I removed it earlier than I should have. 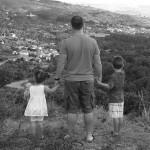 I made a mistake and explained that in detail in a blog post this past fall. It’s currently extended from the 200-d m.a. and has been trending higher for two straight years. The next ideal entry will be closer to the 200-d m.a. if the stock shows support. Since I posted my first completely positive (longs only) screen last night (in November), I decided to share it with everyone on the blog. I still view the market as extended but it is trending higher and until that trend is snapped, shorting stocks will carry risk (at least shorting them the way I do � following the O�Neil approach from his book on shorting). I will post a list of stocks with charts tomorrow that show similar characteristics to the ones highlighted in O�Neil�s book on shorting. As explained below, a couple of these MSW Index stocks clearly vaulted past their pivot points which were highlighted on the weekly screen over the weekend. The NASDAQ is now up 1.71% for the week and is far above the former 100% retracement level that was established back in April 2006. If you pull out on the charts and look at a two year weekly view of the NASDAQ, you will see the deep v-shaped pattern with handle and pivot point breakout to new highs (the highest point since 2001). 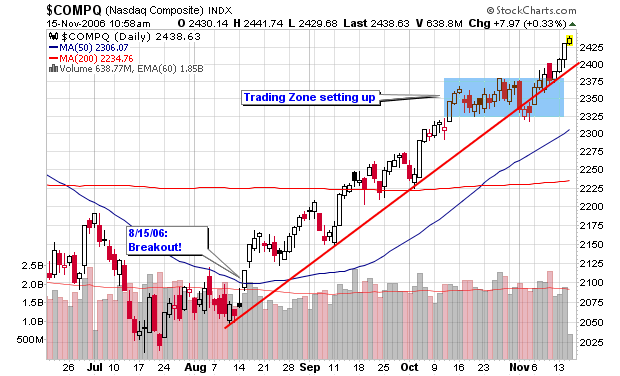 The NASDAQ daily chart clearly shows how the index is climbing along the trend-line I have highlighted in red. Remember, I have been screening shorts over the past several weeks but none of the major indexes have reversed the trend even though they are all extended. Until the trend snaps, we must tread carefully when placing shorts. Due to the extended nature of the market, we must also tread carefully when placing longs or adding shares to current positions. All major indexes moved higher in above average volume as the recently weak retail sector decided to take some leadership. Looking at my charts through the link below, we can see that small caps are gaining strength versus their larger cap peers. Along with these small caps, many growth stocks are starting to come to the head of the class and flex their muscle just as IBD stresses in tonight�s eIBD edition. IBD mentions how the S&P 600, the small cap index, is within 1% of an all-time high. One of the most impressive numbers of the day was the NH-NL ratio finishing at 613-71 as advancing issues beat declining issues (6,314 to 3,657). REMEMBER THE �M� IN CANSLIM! Current Environment: Short term plays (long or short)! The market is extended but trending higher. CTSH � 79.55, a gap-up to new highs that almost erased during the day before trending higher during the afternoon. The ideal trend buy is still near the 50-d m.a. GROW � 39.64, now up over 8% this week as the stock continues to make new highs. �stocks that make new highs typically continue to make new highs until the major trend is snapped�. CTRP � 58.88, the former MSW Index stock is making new highs after becoming a 200-d m.a. play last month. It is up over 20% since mentioned as a 200-d m.a. play in October. Due to last night’s loss by the Mets, I am going to call today’s screen the comeback kids. I am disappointed today as a baseball fan but I will get over it and look forward to next season with a young group of comeback kids (I also have my Giants playing the Cowboys this Monday night). Are the stocks below a bunch of comeback kids? Many of them are only a few years old and are gathering some support near their 200-d m.a. as the market looks to be forming its first pull-back or high handle. The market is overbought and extended so I am cautious with this type of a screen but it is important to look for stocks that can gain support above their 200-d moving average. Many of these stocks are recovering or gaining price strength above their 200-d moving averages but their volume is not cooperating on the weekly chart which does raise a red flag. The stocks screened are ones that made positive gains yesterday, have respectable relative strength ratings and earnings ratings greater than 70% of their peers. Keep in mind that I may have left some solid candidates off of the list because the screen was only looking for stocks making gains during the day Thursday. All prices quoted are from the end of day Thursday. BUCY – 49.40, the recent and former MSW Index stock is back above the 200-d m.a. but volume is lower than the distribution weeks. VMC – 84.20, building a five month cup shaped pattern with recent support at and above the 200-d m.a. Volume has been light so be skeptical. OXPS – 30.19, the former MSW Index stock is back above both moving averages and is gaining volume strength on the daily chart but not the weekly chart. MDR – 44.36, a long time superstar that has been riding above the 200-d m.a. for the past couple of years with its first challenge of support in September. 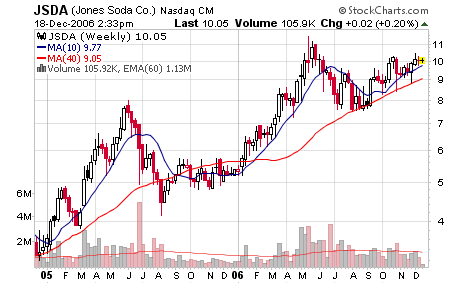 The stock caught support and is looking to recover its 50-d m.a. but daily volume is low. I would wait for a new 52-week high before becoming interested. HSC – 82.20, a strong stock from 2005, Harsco has consolidated in 2006 and is looking to gain some strength here above the 200-d m.a. 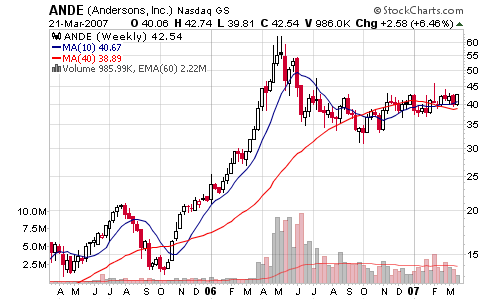 ADM – 37.90, a great stock from late 2005 until mid-2006 with a recent correction back to the 200-d m.a. It seems to be getting some support at the long term support line but must recover back above the 50-d m.a. 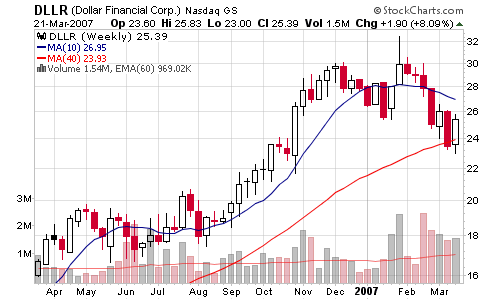 TS – 37.71, one of the top performing stocks on the MSW Index in 2005 and early 2006 but was recently removed due to lack of strength and a declining RS line. It has since recovered the 200-d m.a. and will stay on my radar. I’ve had several requests to do a special screen that locates interesting stocks under $10. As you know, I am not a big fan of stocks trading below $10 but I will perform a screen with this criteria about three or four times per year (to feed the craving). Humans and their psychological minds love to dream about picking that one big winner from a low place and then ride it to riches. It does happen but not very often so don’t build your trading system from this type of thinking. 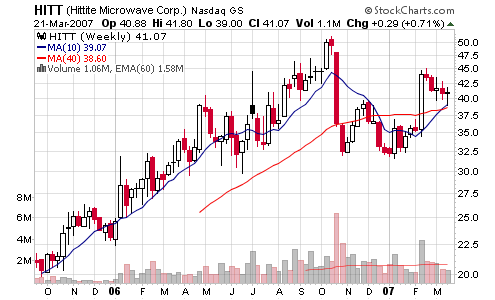 The last big winner on MSW from the sub $10 area was Forward Industries (FORD) in 2005 but this stock has since turned into a short in 2006. FORD etched the classic chart pattern that Stan Weinstein talked about in his excellent book Secrets For Profiting in Bull and Bear Markets (stage 1, stage 2, stage 3 and stage 4 bases). Actually, I think I will save this chart and add it to my technical analysis page on MSW as the “textbook” example of a four stage Stan Weinstein pattern. Now, let’s have some fun and screen some stocks below $10 that present potential opportunities for those of you that can stomach buying these candidates. The stocks below do have decent relative strength ratings and earnings per share ratings. NXG – 3.86, catching support near the 50-d m.a. as it trades in a range between $3 and $4 over the past 14 weeks. SLW – 9.45, the young stock is catching support at its new 200-d m.a. as it starts to build momentum to test all-time highs above $12. A move above $12 shows strength. Q – 8.59, nice strength with confirming volume over the past couple of weeks as the stock continues to tread higher. It has a long history of higher prices so it could be a longer term winner. GNA – 9.58, a trading range has developed between $8 and $11 but the most recent high in July could not surpass the prior high from April which is typically negative. A move above $11 would grab my attention. NSSC – 9.65, seems to be catching support at the 200-d m.a. with a trading range between $8 and $12. It must move above $12 to prove the potential advance. DTLK – 9.13, the stock is EXTENDED at current prices but it can become a buy opportunity if it falls back towards the 200-d m.a. and catches support. I wouldn’t consider a position until it at least pulls back to the 50-d m.a. just above $7 and fills the gap from last month. 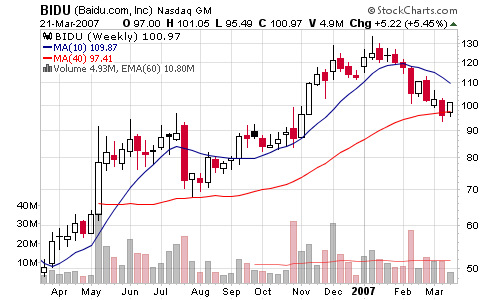 GIGM – 8.58, building a 14-week base with support near $7 and resistance at $11. A double top breakout will confirm on the point and figure chart above $10.50 and a new high above $11. 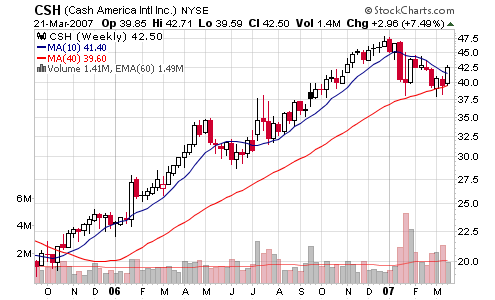 CUP – 4.22, low priced risky stock that is looking to catch some support near $4 and the area above the 200-d m.a. With stocks gaining strength, commodity related stocks are declining but if Gold regained its footing, Peru Copper could continue the advance from its 2005 IPO. 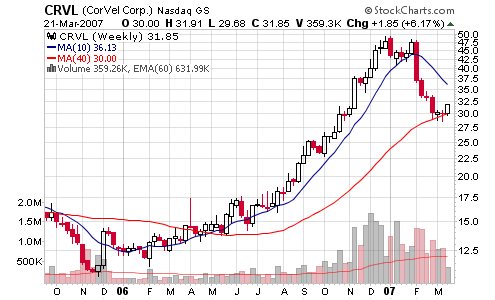 The original pivot point breakout in May was above $4.05 so look for the stock to hold this area. 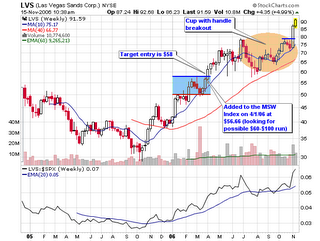 MSW – 10.79, Mission West Properties is above $10 but only slightly. 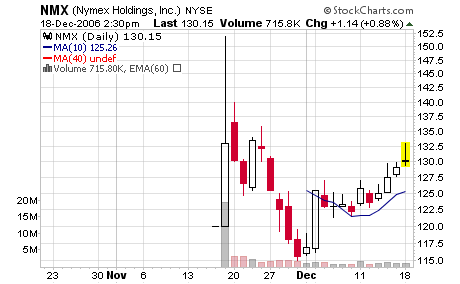 I don’t know much about this company but it is gaining some strength near the 200-d m.a. as it consolidated from the prior run earlier in the year. The stock has not trended much over the past several years but I thought it would be fun to check the chart. 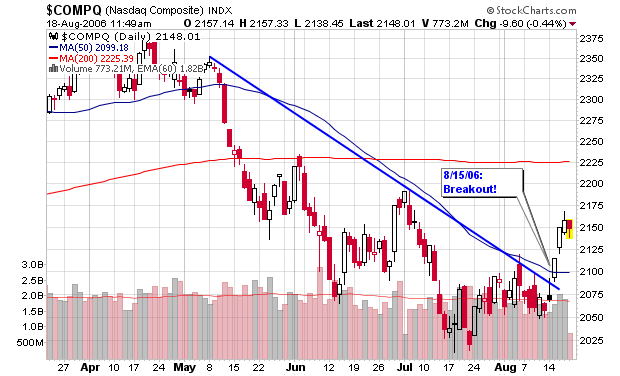 I have also included a chart of the NASDAQ which shows the breather that I indicated in yesterday’s blog entry. The index is pulling back today (expiration day) while some investors ell at this first Fibonacci retracement level. 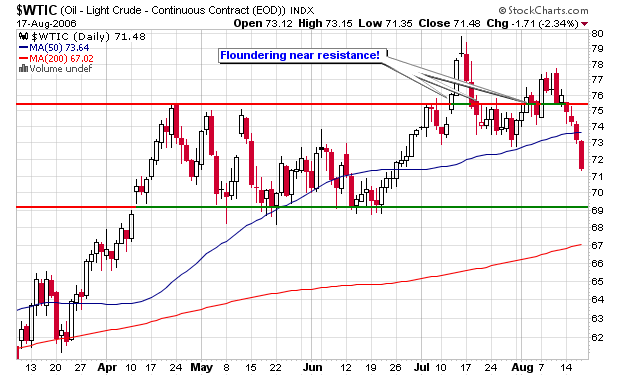 I also included a chart of the crude oil contracts as they are crashing down through the 50-d moving average. Major support is still owner near $69-$70. 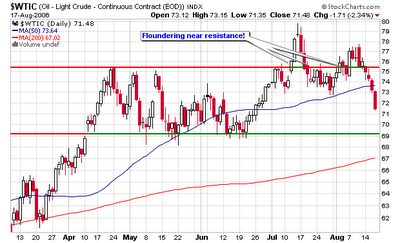 It will be interesting to see crude challenge this area; territory it hasn’t seen in two months.